Mobile steps with cup enclosed retractive swivel castors. Wider base gives extra stability and compliance to the latest EN131-7. Please ensure the max. width is suitable for your workplace. Sheet steel treads with a choice of rubber or anti slip grit type surface. Fully welded construction with a powder coated finish in a choice of four colours. Platform width x depth mm; 406 x 406. Moving around and working at height can be a common occurrence, however even if the users are only on the steps for a short period of time, they will need to be comfortable and safe. Our mobile cup steps are a great addition to help the user work at height with cup enclosed retractable swivel castors. The steps lower on to a firm rubber foot when body weight is applied. 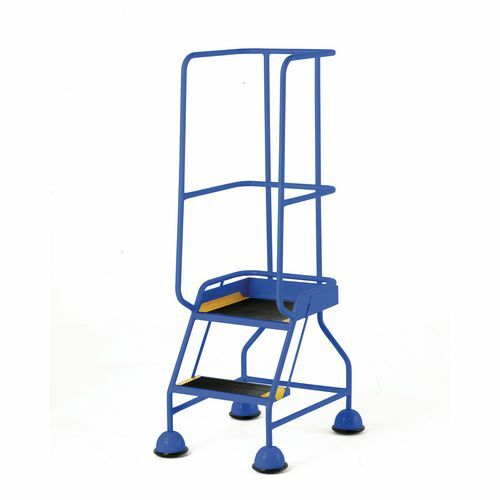 There is a maximum load capacity of 120kg and a wider base gives extra stability, helping the user feel more secure. They are compliant to the latest EN131-7 standards and there is a platform providing an excellent area for the user to work on. The fully welded construction has a powder coated finish which is available in a choice of four colours; blue, green, red or yellow. The sheet steel treads come with a choice of rubber or anti-slip grit type surface. There are four platform heights to choose from; 508mm, 762mm, 1016mm or 1270mm. 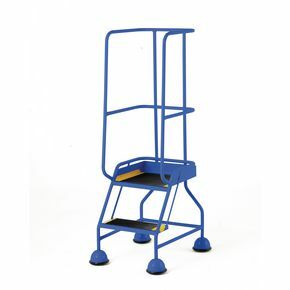 Our mobile cup steps are a great addition to the workplace making working at height easier and safer and they come with FREE UK Delivery.